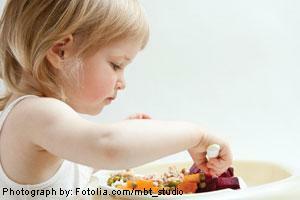 Every parent wants their child to develop good eating habits. The kind that involve using a spoon or fork, saying please and thank you, and eating while sitting down. “Teaching starts from the very beginning,” says parenting coach Rosemary Greisman. 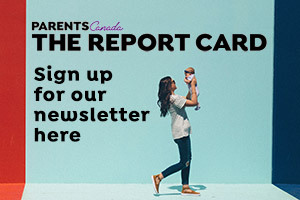 “You want to establish early on the kind of eating habits you want your child to continue throughout their lives.” Rosemary recommends what you can start teaching and when, starting with the first day your baby eats solids. Now is the time to start introducing your baby to solids. It’s important to expose them to lots of different foods when they are little so they have an expansive palate. Let them experience different tastes. Even if they don’t like it, don’t give up. Try again the next week. Balance vegetables, protein and starches by making your own or buying. Put them in a high chair or secured booster seat. Give your baby a spoon. They can’t use it yet but expose them to utensils early. Sit them at the table in a high chair when eating. Share your food with your baby and introduce them to it in bite-sized pieces. Turn off distractions like the TV and have conversations around the table. Teach your toddler to sit in a chair at the table; bring them back if they leave. Keep introducing them to new tastes and textures. Offer them a snack between each meal, such as fruit. Skipping sugar is the key. You can set up a low shelf of foods so they can help themselves. This will help to develop their independence and confidence but in a controlled way. Introduce a regular cup. It may be messy, but it’s important that they have the opportunity to practise. Use kid-friendly cutlery and plates to make eating fun. This is important when kids are little. Teach them that throwing and spitting food is not acceptable. Ensure that they eat even a small breakfast even if they say they aren’t hungry. Protein is especially important in the morning. Offer milk, water or diluted juice to drink. Don’t have foods or drinks in the house that you don’t want them to have, such as pop. Try to avoid packaged food but when you do buy packaged, read the labels to ensure there are no harmful sweeteners, oils or other hidden ingredients.